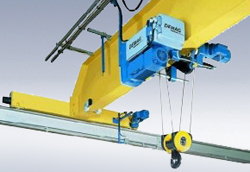 Overhead cranes are a standard fixture in most industrial, manufacturing and assembly environments. Engineered to solve complex material handling applications, motors, control systems, drives, and mechanical components are designed to work together for maximum, flexibility, performance and reliability. Each industry has stringent performance requirements that may include automation, frequent operating cycles, high speeds and difficult environments. 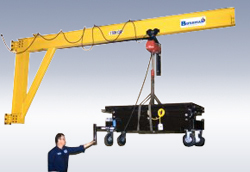 Custom-engineered overhead lifting solutions improve efficiency, productivity, work-site safety and reduce environmental impact. 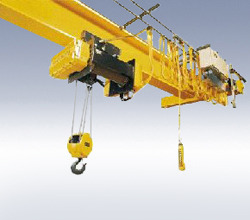 Bridge cranes, the most common type of overhead crane, consist of girders, trucks, end ties, a walkway and a drive mechanism, which carries the trolley and travels in a direction parallel to the runway. Gantry cranes are a type of overhead crane in which the bridge for carrying the trolley or trolleys is rigidly supported by two or more legs running on fixed rails or a runway. 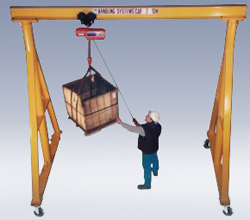 Hoist cranes are a generic type of crane that is capable of lowering and lifting a load. Most cranes have hoists. Jib cranes are designed with the bridge girder, commonly called the “boom,” fixed at one end, allowing the opposite end to cantilever. The fixed end generally is hinged to allow rotation, and the jib can be telescopic. Steel-processing companies rely on the use of cranes for high-capacity utilization in storage facilities for flexibility of product handling and to meet the demands of faster response times. Steel service centers typically require facilities that have unique requirements which include varying overhead crane capacities, a heavy industrial infrastructure and, usually, rail access. 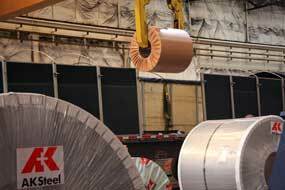 The processes of storing and handling of coils, long bar material and sheet metal have to be performed continuously and reliably.